Nothing grates like a drain grate. Slamming into a hunk of uneven metal at high speed can really spoil your morning. They come in many different varieties, sizes and depths and are, usually, at their most dangerous when riding on busy roads where you spend a lot of time gutter-hugging to keep away from trucks, taxis, buses and, worst of all, SUV drivers texting away on their iphones. 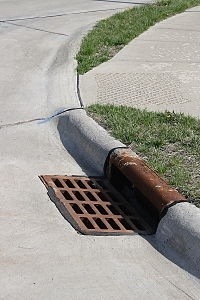 Sunken manhole covers can have a similar effect when encountered unexpectedly, however unlike drain grates they usually appear in the middle of roads giving panicked riders the option of swerving violently to the left or right. Not sure about you, but I know of at least four incidents where grates have brought down riders. Watch out for them! Types 1 & 3 are ok but type 2 are deadly – why are the slots always parrallel with the road rather than perpendicular and what genius designed them so that the slots are the perfect size to fit a 23mm bike tyre?! Wow, four incidents! I’ve been riding and racing for 12 years and can’t remember any! Maybe it’s early onset Alzheimer’s! You winding me up TJ? Might be. Nah, I was talking about myself re Alzheimer’s not you!